Hello, my name is Odie and I am 10 full pounds of puppy love! 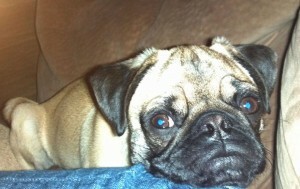 I MUST have another Pug to play with though. I’ve been hanging out here with my foster family and other pugs for a couple of weeks now and I am ready to find my “furever” home. I am 4 months old and I love to eat, sleep and play, play, play. I really like to play with my foster pug brother. I want to play with my foster family’s cat too, but she doesn’t seem like she is too friendly, she always runs away. I love to meet new people and like to be in the center of everything, but when its bedtime, I like to snuggle up with my foster mommy and daddy and sleep like a puppy. If you think you would like to snuggle with me too, click on the link below to fill out an adoption application today!